A ray that reduces an organic being to ash instantly. The weapon itself is described as "a long metal tube" which is pointed at the victim. "All was ready, yet before emerging onto the upper Eartth, they decided to have a sure, deadly weapon against the races of man, who might molest them in their work. So they developed a deadly ray, a ray that crumbles a human body into a puff of white powder instantly..."
...As a number of them [Martians] began to climb up the pillar, the blue ray of death flashed out from inside the box and cut a wide swath through their numbers, reducing those it touched to white powder in an instant!" 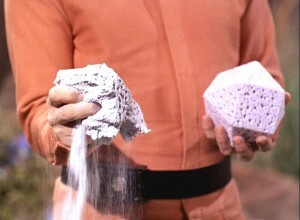 Fans of Star Trek TOS may recall the episode By Any Other Name; an alien ray reduced crew members to polyhedra of crumbling salts. The good news was that the person could be reconstituted - the bad news was once a block was crumbled, that person was gone.